By Sean Jones: With Manny Pacquiao seemingly not interested in facing Errol Spence Jr. in a unification fight despite having agreed to fight him, Shawn Porter broke the news on Monday that he plans on fighting Spence (25-0, 21 KOs) next on pay-per-view. WBC welterweight champion Porter (30-2-1, 17 KOs) says he’s already in the gym preparing for the fight against the unbeaten IBF champion Spence. Porter, 31, states that he takes confidence that he can go into Spence’s hometown of Dallas and beat him, because boxing greats Shane Mosley and former IBF/WBA/WBC middleweight champion Marvelous Hagler, who he believes he fights similar to, were able to show that they can defeat the best during their careers. Porter notes that Hagler (62-3-2, 52 KOs) was able to go into different fighter’s hometowns and beat them. Since Porter feels he fights like Hagler once did, he’ll be able to beat Spence. “I think we got Errol Spence next,” Porter said to the boxing media in breaking the news he’ll be fighting Spence in a unification. “We’ll see. Oh yes, it’s pay-per-view. You’ve seen now I can box. I boxed pretty well against Adrian Granados. Against Danny Garcia, he expected me to come after him for 12 rounds. I boxed him for six or seven rounds, and then turned it on from there. I used effective aggression against him,” Porter said. Porter’s wins over Danny Garcia and Adrian Granados is irrelevant when it comes to Spence. Beating those two fighters, who are more fringe level guys at 147 than championship level, it doesn’t mean that Porter will be able to beat Spence. It just means he could beat a couple of limited former light welterweight, who has no real business fightig at 147. You can understand why Garcia and Granados are fighting at welterweight. The money is better in the 147 lb division than at 140, but Porter shouldn’t get things twisted by thinking that his wins over these two former light welterweights means he’s going to be able to beat Spence. “Against Errol Spence, I have to be 100 percent, and I know I have what it takes to do it,” Porter said. “I’m already back in the gym. I’m doing everything it takes to get ready for when that call comes for that fight. I’ll be prepared, because I understand how big an opportunity this is; not just from a pressure standpoint, but from everything I’m going to be putting into getting prepared,” Porter said. The timing of this fight could be better. Porter is coming off of a controversial 12 round split decision win over his WBC mandatory Yodenis Ugas (23-4, 11 KOs) on March 9 in a fight that a lot of boxing fans felt he lost. While Porter maintains that he should have won, the fans largely disagree. The fight was scored 116-112, 115-113 for Porter, and 115-113 for Ugas. Boxing News 24 had Ugas winning by a 116-112 score. Porter not being able to conclusivley beat Ugas suggests that he’s not going to do well against Spence no matter what he says to the boxing media. Porter seems to be trying to give himself a pep talk in comparing himself to Hagler and Mosley. That’s not going to get him the way, because he’s not either of those fighters and he doesn’t fight like them. Porter has a mugging style of fighting. That’s not how Mosley and Hagler ever fought. Those guys would beat their opponents with power shots, and clean effective punching. They didn’t wrestle with their opponents. 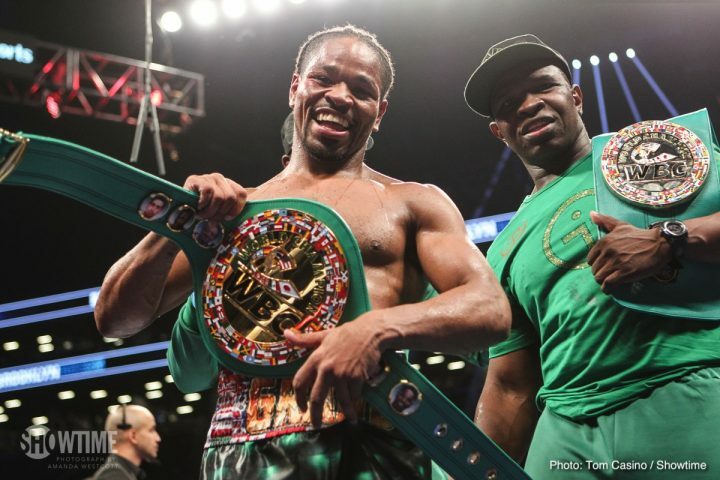 “I’ve always wanted to be like [Shane Mosley], and Marvelous Marvin Hagler,” Porter said. “I’m a lot like him like I always wanted to be. The same goes for Shane Mosley. You’re talking about me taking on a guy that nobody wants to take on,” Porter said about Errol Spence. “I look back and see that Shawn did it, and who he did it against and see how he put it down. I understand that works. When I look at Marvin Hagler, who had to go into other people’s backyards just to get the job done. I might have to go into his [Errol Spence] back yard in Dallas to get the job done, but Marvin did it. I love Marvin. I’m going to do it too. I can see all the puzzle pieces coming together. Right now, all of it is just talk. I got to get in there and do it. As I said to you before, I’m not afraid to get in there and do it,” Porter said. Porter shouldn’t kid himself in comparing his fighting style to Hagler and Mosley. Having seen both fighters many times on Youtube, this writer must say that Porter is nothing like either of them with the way he fights. Perhaps his personality is similar to them in being easy going, but he doesn’t fight like them. What Hagler and Mosley accomplished during their careers won’t help Porter out when he gets inside the ring with Spence. They can’t fight for him.